Browse the DVD, Gift & Tack Shop. 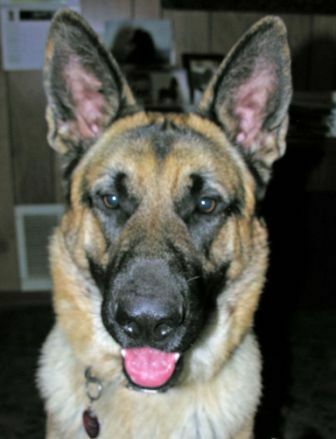 Our 100 lbs. GS watch dog Shiner Bock with Max. He knows who's naughty and who's nice! 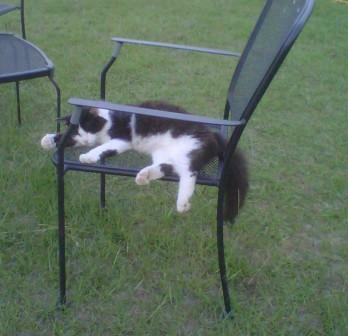 Barn cats rule! We adopt from Sulphur Springs TX animal control, tel. (903) 438-9369. At the AGM in TX February 2009. 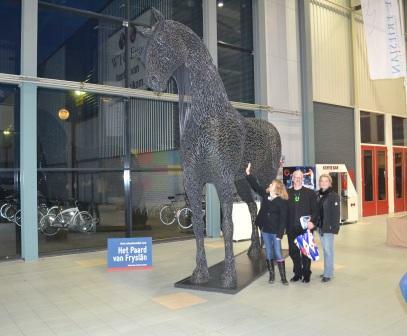 2014 KFPS Stallion Show, Leeuwarden NL, where Anneke has been translating online and live for KFPS & Omrop Fryslan since 2008. Yes! 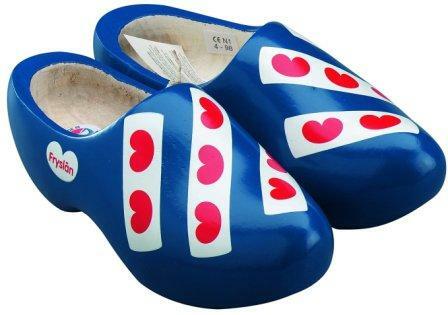 We wear wooden shoes! Welcome to Anneke's Friesians. Home of KFPS Star Stallion Tropical Rider's Wieger. 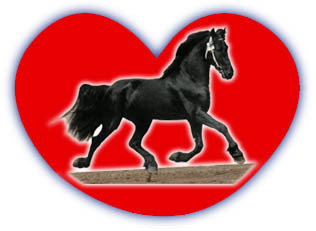 This website shares a lifelong passion for the purebred Dutch KFPS Friesian horse. 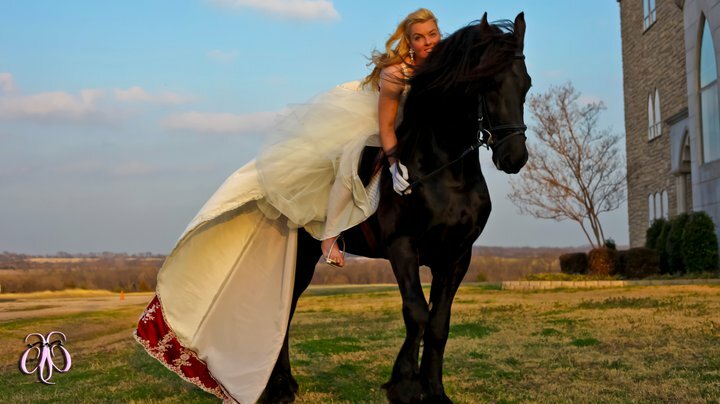 Browse this page if you want to learn more about what's behind Anneke's Friesians. 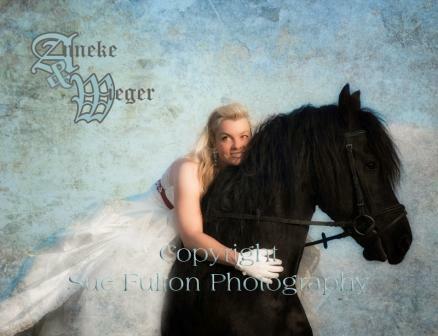 (Pictures header, left & right: Anneke & her Star stallion Tropical Rider's Wieger. We Desire to Inspire. Oant sjen! We are Dutch with Lone Star, U.S.A. & Friesland Allegiance. We are the KFPS simultranslators at the annual KFPS Stallion Show, live & online. 33 Years in the Breed - 10th Year in Business. Dedicated to the purebred Dutch KFPS Friesian since 1981. First and foremost this is the (ongoing) realization of our 'My-Little-Pony/Breyer-barn' childhood dream and a private farm. 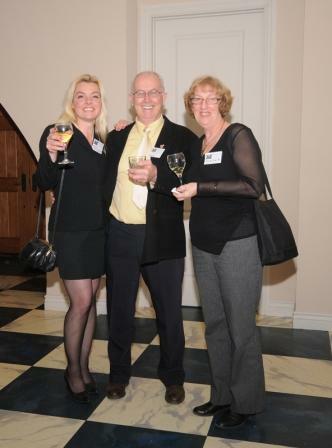 It combines a lifetime of networking, international connections & experience, a dedication to the breed since 1981, and a move from The Netherlands to the USA over two decades ago. We travel back and forth regularly, are fully independent, and available by appointment for the many ways in which we share our ca. 15-head KFPS Friesian herd and 33 years of breed experience with others in a unique way through our business Anneke's Friesians with services such as lessons, training, education, consultation, and sales. Click on any of the topics in the index below or scroll down the page to get to know us better. Working with/studying KFPS Friesians since 1981, The NL, USA, worldwide. We do all our own training, showing, promo, and services offered. Initiator/creator of many of today's chapter concepts. 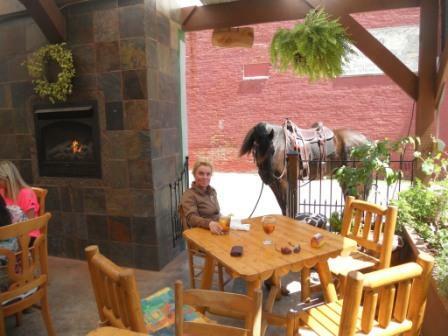 Manager, creator/think tank for 3 years Great Lakes Friesian Horse Association FHANA chapter (GLFHA) 2002-2004. 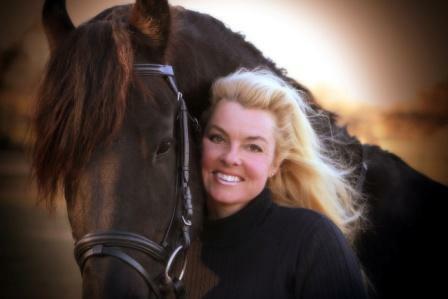 Founder/5-year Manager, creator/think tank for South Central Friesian Horse Association FHANA chapter (SCFHA) 2005-early 2010 including website creator/webmaster 2005-early 2010. KFPS Simultranslator/initiator of this service at annual KFPS Stallion & Anniversary Shows 2008-present. Translator Dutch-English and v.v. (German also available) specialized in Friesian materials, 1996-present. Creator/initiator of the Friesian Fun days concepts, 2009-2011. Since then independent as workshops at our farm (click for info). Founder/Member Black Magic Friesian Performance Troupe 2010-2012. In recent years: Member Hopkins County Rodeo Committee (2011-2012), the H.E.R.D. for various years through 2012, Flying Dutchmen through 2012 to further promote the Friesian horse while making closer community connections. We promote local merchants and Texas tourism with our activities, which we now successfully do without affiliation or memberships (except for membership to KFPS). 1. 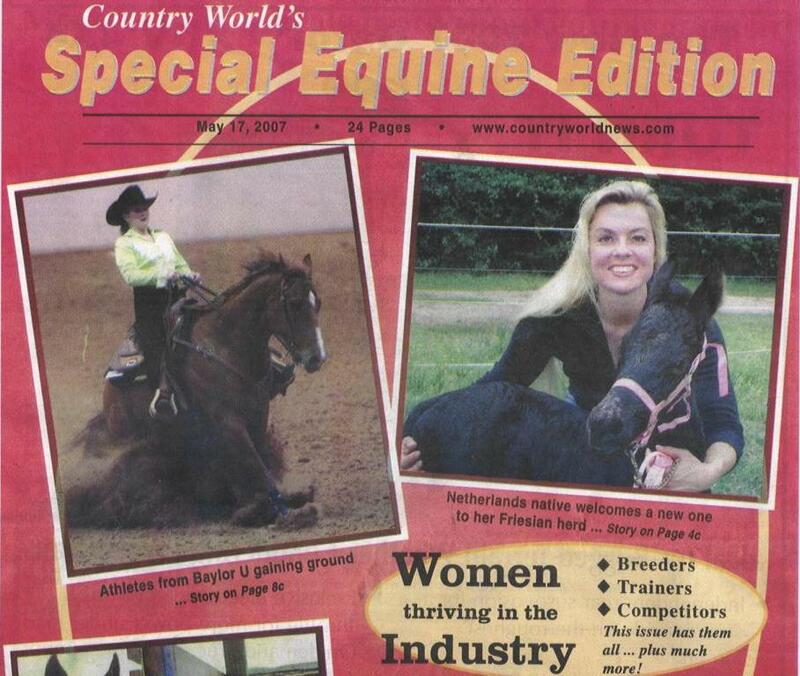 A copy of the Country World cover from May 2007, which featured the Friesians and Anneke in a spotlight article. 2. 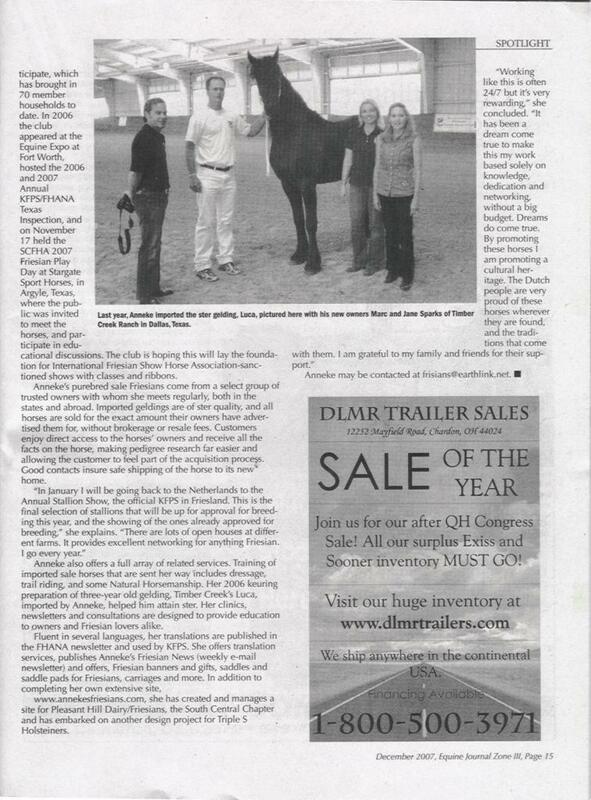 The December 2007 Midwest/west regional Equine Journal magazine, which featured a spotlight on our business. 3. 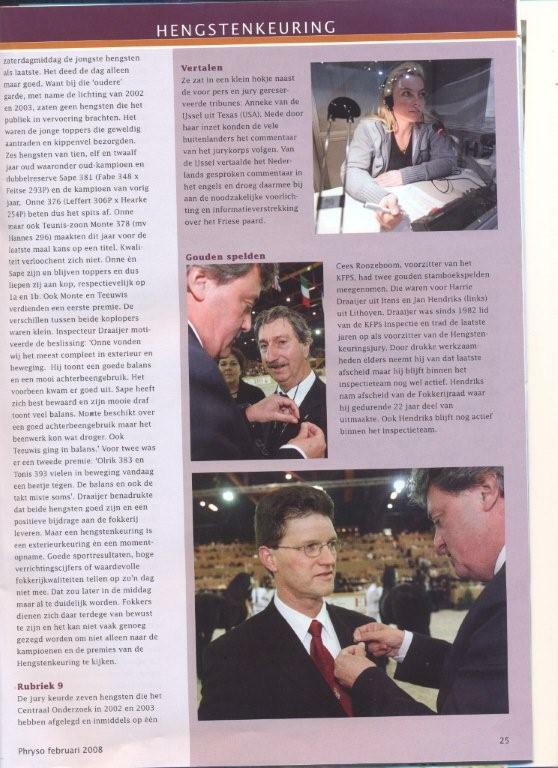 To the right a clipping from the February '08 Phryso with a picture of Anneke doing the simultaneous translating in English at the annual Stallion Inspection in Leeuwarden, featured again in Phryso December 2009. There is also an article on AF on the Dutch website WereldExpat, click here to view this online feature. 4. November 2008 Horse of Kings online Women's feature with 2009/2010 FHANA directory ads. We are regularly involved with interviews and p.r. for various equine publications and radio (including NOS, RNW, and Omrop Fryslan in The NL). 5. Picture of Anneke and her stallion Tropical Rider's Wieger from November 2010 participating in a Year-of-the-Windmill contest by www.RNW.nl, now used by Stichting Promotie Schiedam. 6. Anneke on sale horse Rudy, linked to an online blog article in Classic Equine Equipment under Ranch Life by Sally Wyatt Kirkpatrick, Feb 2013. I was born in a Randstad city and raised in the Achterhoek in The Netherlands; the only one in the family with a passion for horses. 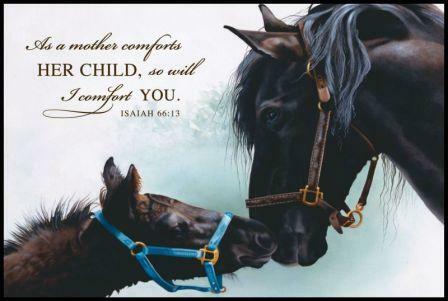 Through the years I acquired lots of horse (since 1977) and especially Friesian experience (since 1981) but would have to wait quite some time and care for other people's horses until owning my own. Now I am blessed with a barn full of Friesians at my quiet country home. 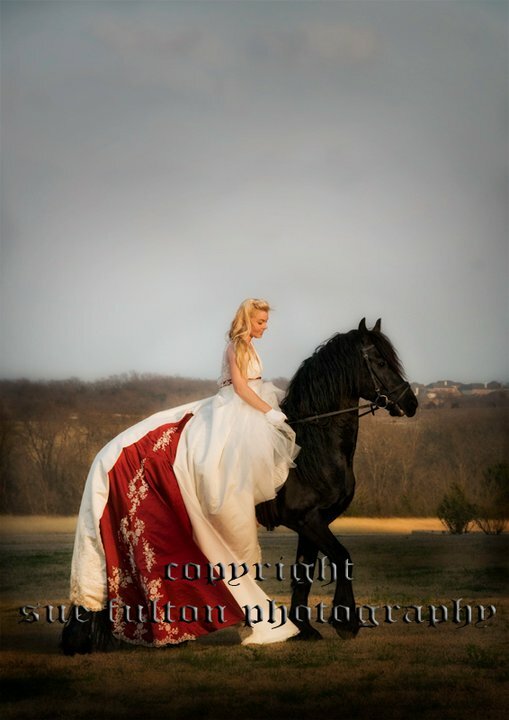 Professional life took me to several major Dutch and American cities in the government and corporate world but slowly I worked my way back to the countryside and equine roots, and live in rural northeast Texas where I am Anneke's Friesians. I have siblings in the south of The Netherlands and my parental home is in the Achterhoek. As a teenager I rode a couple of Friesian horses in the neighborhood. They were my world in the 1980s and would become resp. the grand dam and dam of my first Friesian. Special thanks to the B. family! I showed them at and attended Friesian inspections, trained horses, and have been reading the KFPS Phryso magazine ever since the early '80s, keeping up with the breed in detail since. 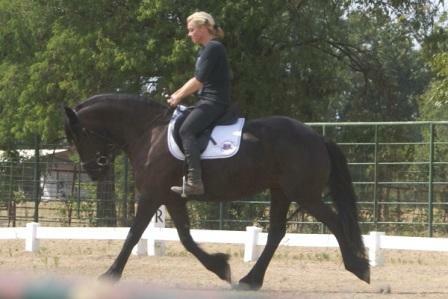 I switched to riding KWPN warmbloods for a few years but never forgot the Friesians and would quickly switch back. Early '90s, I moved from The Netherlands to Washington D.C. The move to America resulted in tremendous growth as well as tremendous challenges. Over these same years I obtained a renewed appreciation for my home country The Netherlands and have found a rich balance between the U.S. and Holland, past and present. Subsequently I would move to Chicagoland IL in the mid '90s and to northeast Texas in 2005. 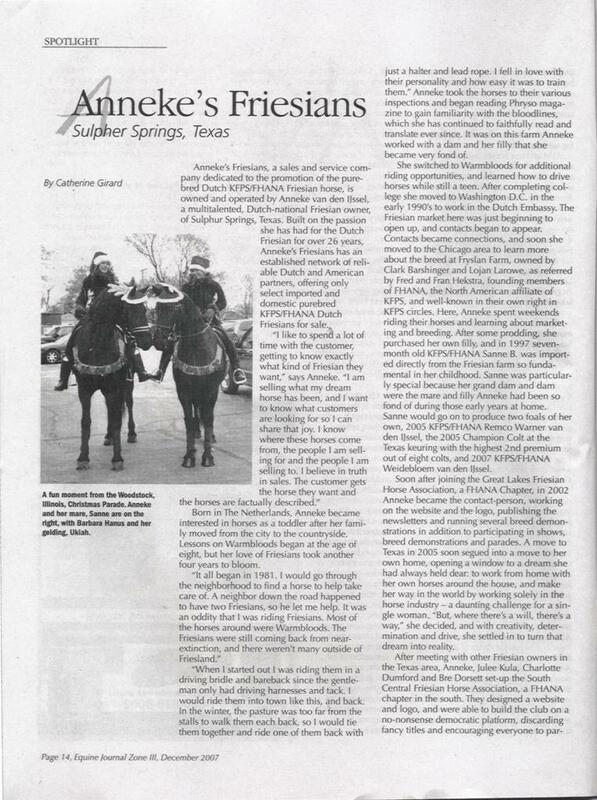 The move to Texas unexpectedly led to the creation of Anneke's Friesians, with all the years of Friesian activities coming full circle. Texas took much getting used to but it also has much to offer so we're here to stay. The Friesian horses quickly returned full-force after my move to the U.S. (a Thank You to the H. family and C&L) at which point I joined FHANA mid '90s and shortly after I imported my first Friesian from my home town in The Netherlands. The Friesians have enriched life in countless ways with a myriad of chapter and promo activities (Great Lakes Friesian Horse Association GLFHA, followed by South Central Friesian Horse Association SCFHA), social events, networking, business, and translation work for the studbook as well as Friesian headliners. I introduced the simultaneous translation service in English for foreign visitors at the annual KFPS stallion show in Leeuwarden in 2008 and have been doing that every year since, including the Mare Show/KFPS studbook anniversary in 2009, and since 2012 live on the internet through Omrop Fryslan. I am proud to have broken much ground for FHANA with chapter work with Great Lakes Friesian Horse Association GLFHA, followed by South Central Friesian Horse Association SCFHA, have taken the Great Lakes Friesian Horse Association GLFHA FHANA chapter from a small group with a stencil newsletter to much of its current status and professionalism from 2002 through 2004, after which I initiated and created the South Central Friesian Horse Association SCFHA FHANA chapter in 2005, ran it for five years, and removed myself in 2010. It was time to move on and 2010 started the private initiative of the Black Magic Performance Troupe. I am glad to have initiated a new FHANA chapter early 2011 for Texas. It was ready to go but denied; I made chapter history yet again but thank the Lord for sparing me. Since that time I have purged any kind of affiliation, association, and membership other than KFPS membership and good friendships/partnerships to cleanse myself of the toxic depths of the world we live in as well as the horse world's putrid quick sands. Now I thankfully and truly am a free agent, continuously making changes in life to enjoy and share in what it was always about since childhood: the Friesian horse. So today in 2014, the Friesian continues to be the driving force. 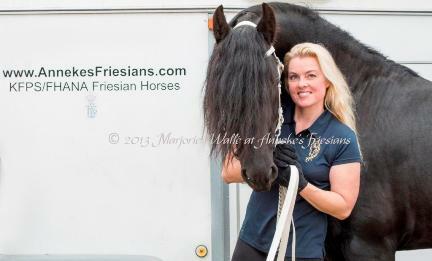 We are pleased to celebrate the 10th year as Anneke's Friesians in 2014 with 33 years in the breed. positive human interaction , gardening (read: property/farm management), animals of any kind, music, singing, games, the great outdoors, swimming & boating, rollerblading, bicycling, good food, solitude with peace & quiet, a clean house, travel, languages, movie channels, educational programming, studying The Bible, gun practice, and trying new things. Be bold, be strong (and make sure to rest up), envision, love (but also don't take any manure), and share, and think about that both morning and evening, when refreshed and then again when feeling tired. Hard lesson to learn and stick with but I keep trying and trying my patience. Most people live their life as a herd animal. I choose to follow my own path and it's taking me home. 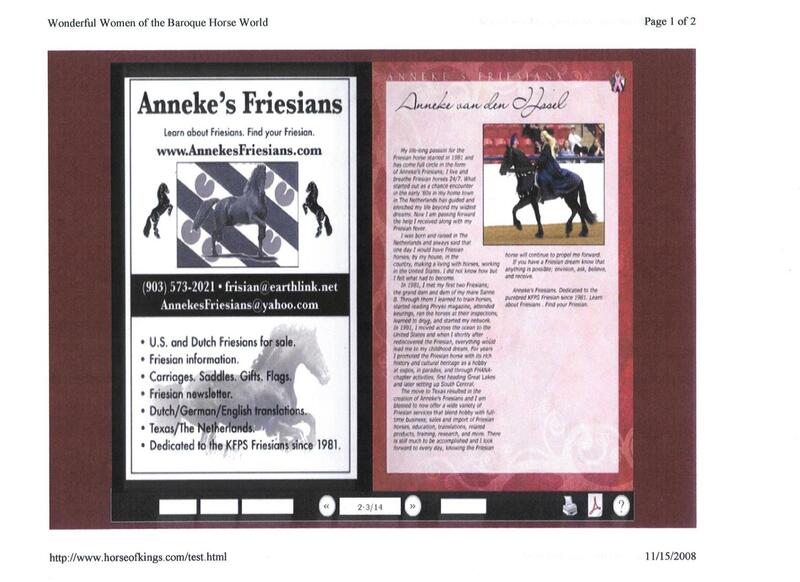 Find more background info on Anneke's Friesians' olden days on the Friesian Love page. We do our own website work as time allows. The goal is to share our ca. 15 head KFPS Friesian herd and 3+ decades of experience in the breed with you. For constructive feedback please visit the Contact-Us page (click). Disclaimer applies (click). Back to index. A special thank-you to family, friends, business partners, and customers; your support is invaluable and appreciated! Back to index. This site is a creation of webmistress Anneke van den IJssel and was last updated 04/03/14. For feedback on this website please e-mail frisian@earthlink.net. Copyright © 2005-2014 Anneke's Friesians. All rights reserved. Information subject to change without notice. Usage/copying without express written request and permission is prohibited.